Although quite controversial, RSS or Red Skin Syndrome, also known as Topical Steroid Addiction (TSA) or Topical Steroid Withdrawal (TSW) is a real thing. This week, we take a deeper look at Red Skin Syndrome and what treatment options are available for those suffering with the condition. We also take a look at some of the work the TSW community is doing to help heal within as well. If you’ve been suffering from RSS, TSA or TSW and have tried countless creams and treatments, we encourage you to read on. Please keep in mind that although these suggestions can help provide relief, we are in no way medical professionals. This condition requires medical intervention to avoid infection. Red Skin Syndrome is a debilitating condition that arises after the misuse of topical steroids to treat a skin condition (like eczema). Topical Steroid Addiction is another term coined for this condition. Many people with Red Skin Syndrome condition experience extremely red, itchy, burning skin, which is both extremely painful and uncomfortable. The term Topical Steroid Withdrawal is used to define the symptoms that arise after discontinuing, reducing potency or reducing application of topical steroids. This condition is an iatrogenic (an illness caused by medication, in this case, the misuse of a medication). While there is much research out there both denying and supporting topical steroids, the truth is that this condition is very real. However, like many other debilitating conditions, there are misconceptions of the illness as well as topical steroids in general. If you think you or your child may have Red Skin Syndrom, I highly recommend you read Is it Just Eczema or Steroid Induced Eczema? Then definitely speak with your physician – we do not recommend weaning your child off steroids without medical help. If you have been on topical steroids for more than two weeks without a break, you are at a higher risk for topical addiction and it’s very important to talk to your doctor about either learning to use steroids correctly with the mandatory break between two week doses or weaning yourself off the medication all together. We recommend you also read more about the risks of weaning yourself off topical steroids if you do in fact have Red Skin Syndrome. This post is a good read on the topic. Dr. Peter Lio has been studying this condition for many years and has helped countless patients going through these symptoms. To learn more about what his thoughts are on topical steroids, as well as Red Skin Syndrome, make sure to check out our blog post: Topical Steroid Withdrawal: Myth vs. Reality. Because Red Skin Syndrome is a debilitating condition, it’s important to seek medical advice as soon as possible. At the moment, there are no universally approved medications or methods of treatment that can quickly cure the symptoms of Red Skin Syndrome, yet your doctor can advise pain/itch management strategies, as well as appropriate medical treatments. Many doctors look at weaning a patient slowly off of topical steroids, so that their skin doesn’t immediately flare up. There is a new treatment methodology which is receiving a lot of attention these days is called the Aron Regime. We had the pleasure of recently meeting Dr. Richard Aron, who created this new approach to treating both severe eczema and Red Skin Syndrome. While we are not big supporters of topical steroids, after learning about Dr. Aron’s success rate with helping patients with severe Red Skin Syndrome, we were intrigued. And it turns out many patients are able to use his method to safely and slowly reduce and discontinue their use of steroids all together. What’s the key to his approach? He treats the inflammation with a low dose topical steroid, dryness and skin barrier weakness with an emollient and the essential key to the treatment formula…..treating topical infection with a topical antibiotic. The second essential part is that he combines all three things – steroids, moisturizer and antibiotic – in a recipe that is compounded at a local pharmacy. Why does it work so well? Dr. Aron has said 70-100% of eczema patients have a topical infection of Staphylococcus Aureus on their skin. Steroids will not stop infection, so only treating with steroids is not the answer to healing eczema. The key really is treating the infection, inflammation and dryness together. Curious? Learn more on Dr. Aron’s website. While working with your physician, here are some things you can try for added relief. Find and eliminate triggers – it is critical. In fact, I dare to say that this is the #1 thing anyone with eczema should be doing in order to find relief and possibly heal their eczema. If you don’t eliminate your triggers, your eczema will come back and you’ll have to continue using medications and skincare and all that jazz. Diet often plays a part in eczema and certain foods can be triggers. Try an eczema elimination diet to find your food triggers – always work with a nutritionist to make sure all proper nutrients remain in your diet, especially when nursing or when children are involved. There are a lot of other triggers that can be at play beyond food, learn more in Eczema 102: What Can Trigger Eczema? Relieve the itch-scratch cycle. Eczema sufferers are known to have an increased risk for staph infection, as indicated above, so keeping skin properly protected, as well as moisturized is key to healing from Red Skin Syndrome. To prevent scratching, consider eczema mittens and gloves. Keeping the hands covered with eczema gloves for adults or for children is essential to prevent scratching and causing an infection. Another idea is to soothe the itch during the day or overnight with Remedywear clothing for eczema : shirts, pants, bandages, gloves, socks and more! These garments are made with cooling fabric, as well as zinc oxide to reduce itching and inflammation. Keep skin well moisturized and hydrated. 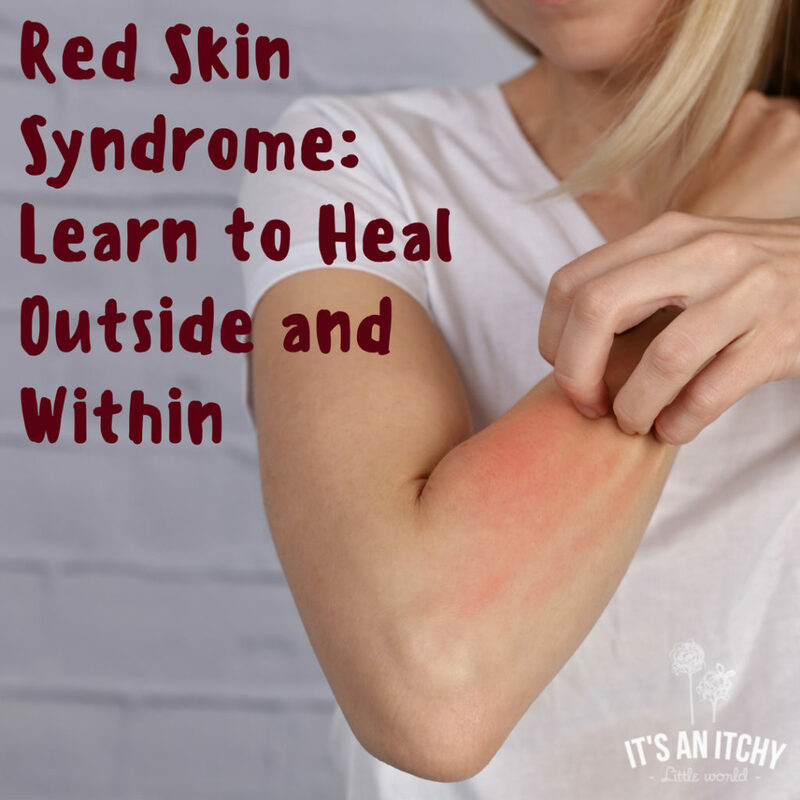 During Red Skin Syndrome or TSW, the skin becomes extremely dry and as such causes an itch-scratch cycle that can be quite unbearable. Opting for a natural eczema treatment that uses few ingredients is a great choice, as it will be sensitive enough for skin going through these symptoms. Some wonderful natural eczema treatments that can be used are this Organic Manuka Skin Soothing Cream, which contains only olive oil, beeswax, manuka oil, manuka honey, filtered water, and grape seed oil. Not only is this cream extremely moisturizing and can relieve the driest skin, but the manuka is also anti-bacterial and wound healing. Another topical steroid withdrawal treatment is using Chinese herbs to help relieve angry, red skin like with this Emily Skin Soothers for Red Eczema Rashes.This balm is a perfect treatment for weeping, crusty and red eczema. Not only does it relieve irritation but it also treats topical bacteria, yeast, and fungus. This treatment also uses natural ingredients like organic sunflower oil, beeswax, frankincense, red peony root, dictamnus root bark, and phellodendron bark. Aside from healing from the outside, it’s important to also focus on your inner health as well. Like mentioned previously, Red Skin Syndrome can affect mental health. Many of those suffering from this condition experience depression and anxiety as well. What turns out to be a physical journey, can manifest into both a mental and emotionally draining journey as well. This is why we recommend watching these incredible tips for living with the emotional challenges of eczema from a dear life coach friend of ours. If you are suffering from depression or anxiety from this condition, it’s important to remember that you are not alone. Seeking help from both a medical doctor for your Red Skin Syndrome, as well as a therapist or psychologist is important, as the journey can be difficult. Aside from seeing specialists, it’s also important to keep stress down to a minimum. Remember that stress is a huge trigger for eczema. For more guidance on how to heal both your skin and mind, make sure to check out our blog post: Eczema and Depression: How to Help your Skin and Mind. Briana is currently filming a new documentary that focuses on the severity of this condition. Learn why she produced the above video and what she hopes to accomplish with her new documentary, Preventable: Protecting our Largest Organ. “My motivation behind creating the music video stems from the inner battles we all face going through TSW. Our condition is way more than a surface issue. Our self worth is diminished, our demons magnified, and the loneliness we feel can consume our every thought. We become our worst critics and it’s difficult to face the world when all we can think most days is about how ugly and unlovable we are through Topical Steroid Withdrawal. I wanted to show our community that we are more than our skin and that we could tackle our fears. We need all the support we can get since this condition still isn’t recognized or taken seriously in many doctor’s offices. Are you suffering with Red Skin Syndrome, Topical Steroid Addiction or Topical Steroid Withdrawal? Please tell us about your journey. Great info! You are providing the best info about the red skin syndrome. I appreciate this article. Thanks and keep sharing. Thank you Laura! I have suffered from eczema severely since I was very small- now I’m in my late 40s, so it was a long journey to learn how to love myself as I am. As I’m writing this, I’m in pain, red from head to toe with open sores. Sometimes the anxiety is so high just because I hurt so much. I was grateful that my three children did not inherit my skin! I’ve been teaching for over 25 years. Through the years, I’ve been able to offer hope to the parents of children suffering through skin conditions, as well as support to my students, in the form of a smile or just understanding of what they’re going through. It means so much to them that their teacher knows how they feel on the tough days. If there’s anyway I can help in your mission, please don’t hesitate to reach out to me! Thank you so much Loretta! You are an inspiration for the eczema community! This is very upsetting. TSW is real and it is not because of a misuse of steroids – most TSW patients were using the steroids as prescribed by doctors. Furthermore, Dr. Aron’s treatment uses steroids to treat steroid withdrawal, which is ridiculous. It’s like drinking beer to treat alcohol addiction. The statement that all eczema patients have staph is also simply not true. Until we get the facts out to people, this real and dangerous condition will not be recognized by the greater public and most of all, doctors. These people and children are suffering and dying. Something has to change. www. itsan.org. Hi Rachel – The hard fact is that there hasn’t been a lot of research on Red Skin Syndrome and Topical Steroid Addiction yet. Until there is, doctors and patients are just trying various things to see what works. One very sad truth, that many up to date dermatologists will tell you, is that many physicians (especially if they are not dermatologists) are not prescribing topical steroids safely. They often don’t tell their patients about the mandatory breaks in treatment. Without these breaks (usually after two weeks of treatment), serious damage can be done to the skin. I am not a proponent of topical steroids at all, but I do know that when they are misused (either not properly prescribed by a physician or not properly used by a patient) this is one cause of Red Skin Syndrome. Is it the only one? Probably not. As to Dr. Aron’s treatment, it is one way to slowly and safely wean the body off of steroids. Again, is it the only way? Probably not. Going cold turkey is hard both mentally and physically and can be dangerous for the skin and mental health. Very, very sadly, there have been a few suicides this year specifically from patients who went cold turkey and abruptly stopped steroids. I do not recommend steroids for the treatment of eczema, for all the reasons noted above. But when someone is addicted, they need all the support they can get. I do hope more research is made available soon so everyone can find healing in a safe manner. I went trough tsw. Started almost 4 years ago. Was clear for about a year but now have big patch on face and neck. Went to a dermatologist she prescribed tacrolimus ointment. I don’t know much about it and don’t trust internet or completely the doctor. Is this another cream I could get addicted to or it’s ok? I have a YouTube channel treczema about my withdrawal if you need to see for reference. Please let me know your thoughts I really appreciate it. Hi Terezka – Thank you for sharing your video journey. It looks like you are getting better, that’s great! As far as the ointment you mentioned, I really know nothing about it. I’m sorry. Have you thought about seeing a naturopath or functional doctor to help you on the rest of your healing journey?